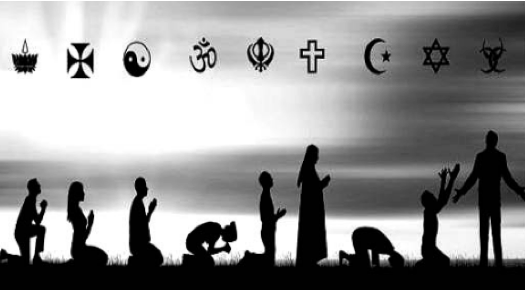 According to a newly published survey by Pew Research Center, religion is a subject that many in the United States avoid debating or even discussing. 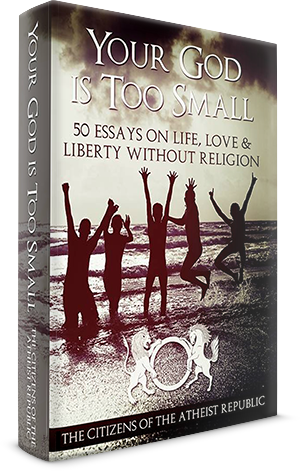 The survey found that approximately half of all American adults rarely or never talk about religion with individuals outside their immediate family and roughly four in ten rarely or never discuss religion with members of their own family. When the survey attempted to find out who talks the most about religion in the United States, the answer was unsurprisingly religious people. 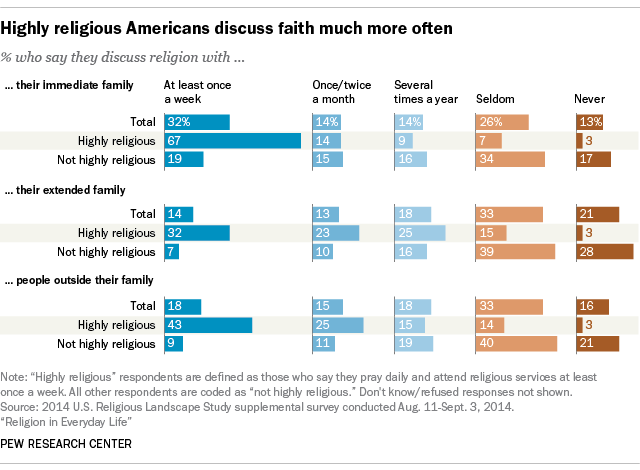 Reportedly, two thirds of very religious Americans, who say daily prayers and attend weekly religious services, discuss religion with their immediate family at least once every week and 43 percent do so with people outside their family. 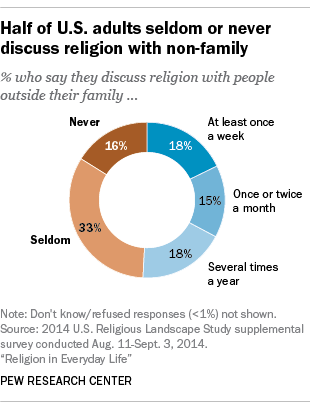 Among less religious Americans, only 19 percent discuss religion with members of their immediate family while 9 percent do so with individuals outside their family every week. According to the survey, members of historically black Protestant churches as well as evangelical Protestants are more likely to engage in religious discussions. Even though more than half of all evangelicals said they talk about religion with individuals outside their family either on a weekly basis or once or twice every month, that may include a fair number of discussions with fellow evangelicals or at least other practicing Christians. Despite the common notion that evangelicals tend to coax others to adopt their religious views, that is not what most said they did, according to the survey. In fact, when the surveyors asked respondents what they did when someone disagreed with them about religion, only 10 percent evangelicals said that they tried to persuade the other person. As much as 70 percent evangelical Protestants on the other hand try to understand the other person’s beliefs before agreeing to disagree while only 18 percent choose not to discuss religion with him or her in the future. Over this question, only a few differences were found across most major religious groups. For example, like evangelicals, most agnostics and atheists share a live and let live attitude about religious differences. 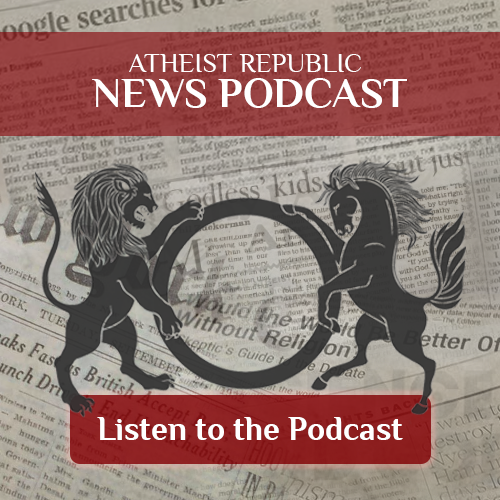 In fact, the stereotypical image of an argumentative atheist incessantly trying to convince people to give up on their respective religious beliefs did not match with their self-described behavior. The survey found when agnostics and atheists meet people who do not agree with their religious views, only 4 percent tries to convince them about changing their mind. 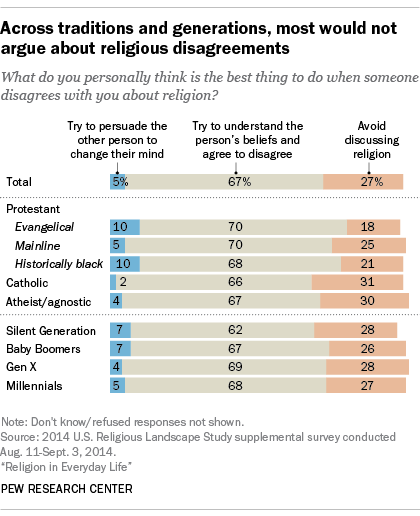 As many as two-thirds of respondents in this group said they attempt to understand the other person and agree to disagree while 30 percent said they refrain from discussing religion with the other person altogether. As a matter of fact, three-quarters of agnostics and atheists said they either rarely or never debate over religion with individuals outside their immediate family.